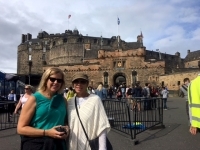 WHS language arts teachers Julie Davidson, left, and Ann Hasenorhl participated in a theater and performance program based in Scotland. Three Westlake High School teachers spent part of their summer participating in field seminars as 2018 Fund for Teachers Fellows. Science teacher Melissa Barth, and language arts teachers Julie Davidson and Ann Hasenorhl, were selected by Fund for Teachers and the Martha Holden Jennings Foundation to participate in professional development opportunities. Hasenorhl and Davidson received $3,860 each to participate in a theater and performance program based in Edinburgh, Scotland. The program focused on the study of British playwrights and how the themes of six plays deal with global issues. They participated in lectures and workshops, including acting, translating plays and performance studies. They also attended a variety of performances and participated in historical tours of Edinburgh that included the settings for Shakespeare’s “Macbeth”; Alnwick Castle in Northumberland, UK, which doubles as Hogwarts Castle in two “Harry Potter” movies; and Rosslyn Chapel in Scotland, where “The Da Vinci Code” ends. “It was really something to be there in the setting of what we read and teach in our classes,” Hasenorhl said. Both Davidson and Hasenorhl said they always teach the history behind the literature they present to their students. This program provided them the opportunity to visit the historical sites where the literature they read in class takes place. Hasenorhl said the fellows program gives teachers the opportunity to create their own professional development experience that is personalized to what they teach. “A lot of this program was about storytelling; and we are storytellers as teachers,” Hasenorhl said. Barth received $2,384 to participate in a summer Yellowstone Citizen Science Initiative, a collaboration between Yellowstone National Park and Yellowstone Forever, the park’s education and fundraising nonprofit partner. Yellowstone Forever also provided Barth with a tuition waiver for the program. The field seminar focused on phenology and climate change at Yellowstone National Park. The Yellowstone Phenology Project includes field work, sorting and mounting insects using microscopes, labeling specimens, and data entry. Barth also participated in the Yellowstone Pika Project, which monitored these members of the rabbit family; Red-tailed Hawk Nest Monitoring; and Home on the Range, which involved collecting demographic information on the park’s bison population. Barth is using the experience to inform a student-centered research project based in the WHS Cultural Pollinator Garden. AP environmental science students will monitor bloom times on plants and how it impacts pollinators, including honeybees in the two hives on the site. Barth ordered a weather station to help with the monitoring and will use the protocols she learned at Yellowstone to collect and share data through the National Phenology Network’s Nature’s Notebook app. She plans to register the WHS Pollinator Garden on the NPN’s phenology site, which will allow students and community members to record what they observe in the garden. Barth parlayed her Yellowstone experience into the National Park Service’s Teacher Ranger Teacher program. She was selected by the NPS to work with staff at the Cuyahoga Valley National Park and Conservancy to write citizen science curriculum on water quality for high school students. 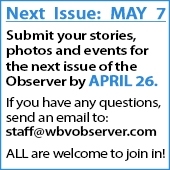 The Cuyahoga River, Barth explained, is still listed as having poor water quality – a designation the park system hopes to change by 2030. Data from the water quality monitoring by high school students will contribute to the goal of showing improved water quality over time.